Got any items on your to-do list that you’d like to check-off before the first snow flies? Fly a hot air balloon ride over Pinkney; paddle a canoe down the Huron River at sunset? For me, having friends over for a cookout featuring grilled paella tops the list. 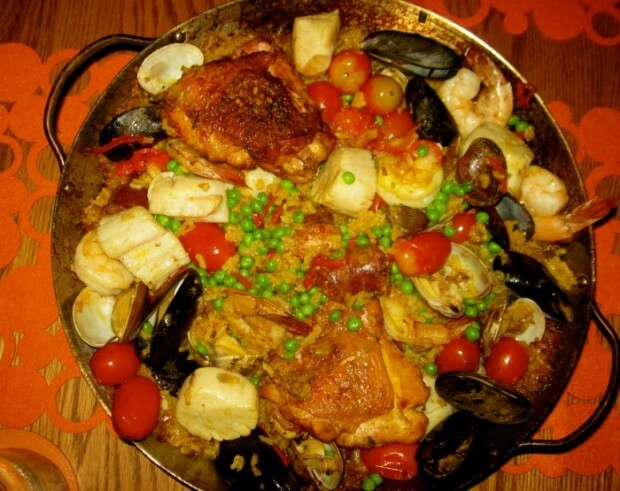 Paella is to Spain what risotto is to Italy: a traditional rice-based dish important to the culinary heritage of each country, the varietal of rice used and method of cooking the rice critical to the authenticity of the resulting dish. A properly cooked paella should have a caramelized and slightly crisp crust, in Spain know as the soccarat, and a risotto should be creamy with a chewy texture. Unlike a risotto, which must be continuously stirred, when making paella, the bottom of the pan must not be disturbed after all the ingredients are added to develop the crackly layer. I have an oven-stove-top method for paella, which I’ve made in the past with delicious results, but I wanted this paella to be different, to be as authentic to Spain as available ingredients allowed, so I got to googling. If I want to be truly authentic, I should cook my paella over an open fire. Not an issue with my charcoal grill. Rabbit and snails would also be a part of this dish. Nah – I’d prefer chicken and shellfish in mine. 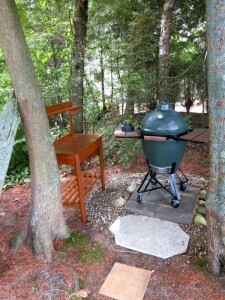 The Big Green Egg paella pan is perfect for my large egg, but would be suitable for most larger grills, as well. I special-ordered a paella pan from Downtown Home and Garden that was suited for outdoor grilling, particularly for my large Big Green Egg smoker, but I’m sure the pan would work for any grill. 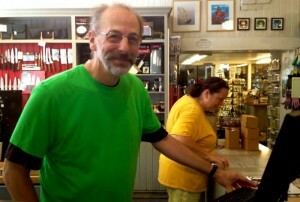 Bill Moran, one of the many go-to employees at Home & Garden sold me the pan, and regaled me with paella stories from past customers, including his own. “The first time I made paella was many moons ago,” Bill said. “Back in the old days of Kerrytown. I went to Bob (still owner of Sparrow Meats) and asked him to set me up with paella ingredients for two; he sold me chicken thighs and chorizo. Next, I visited Mike (still owner of Monahan’s Seafood) and asked him to set me up with paella ingredients for two; he sold me shrimp and clams.” Bill said he didn’t have a recipe, only relied on the advise of the various merchants. Last week, I, too, went to Sparrow Meats and Monahan’s Seafood, asking them to fix me up with ingredients for paella for four. My ingredient list matched Bills’; two decades later, the circle is completed. I had no problems securing the remaining ingredients in the Kerrytown/downtown arena; Zingerman’s and Sparrow Meats stocks the bomba rice, and Babo stocked the peppers. Brenda, Doug & Richard, who assisted me in fine-tuning the recipe. 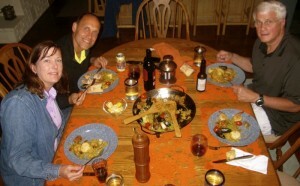 Richard and I had our friends, Doug and Brenda, over for dinner. Brenda’s an excellent cook and a woman I feel comfortable testing new recipes; if something’s messed up, we laugh and pour another glass. I set us up with good Spanish cheeses, Rioja, and Serrano ham for grazing, then placed all of the ingredients beside the grill giving Brenda a stopwatch to bark orders. Hands down, the Big Green Egg helped me to achieve a paella worthy of a fine Spanish kitchen, lending hardwood smoky elements to the flavor profile, and allowing me to fine tune the heat of the flame insuring the fire was hot enough to achieve the crusty chewy crust. I understand that traditional paella is cooked over an open flame (uncovered), but I enjoy the added smokiness that resulted when I placed the top over my egg, particularly in the initial stages of cooking the rice. Covering the grill is negotiable. Having this mise-en-place assembled in advance is non-negotiable, and this is not a good candidate for a make-ahead supper. Your guests can wait for the rice, but the rice can’t wait for the guests. *Extra-large shrimp should be tucked into pan when clams are added. Preheat charcoal/hardwood or gas grill to medium-high heat (400-415 degrees; see above notes for reasons I prefer using a Big Green Egg). Soak saffron in wine and stock; reserve. Season both sides of chicken with kosher salt, freshly ground pepper and paprika. Heat dry paella pan a minute over coals, then add olive oil to lightly cover bottom of pan on grill grate. When oil is hot, add the chicken and sear until golden brown on each side. Stir onions into pan around chicken and when just softened, add chorizo. When beginning to sizzle, add the garlic and cook 30-60 seconds, stirring to insure it does not burn. Then stir in rice; heat two minutes (without stirring), then pour saffron-wine-stock mixture into pan. Cover grill with lid (see above notes), let the rice bubble and cook until just beginning to tenderize and some stock remains, but is not soupy, about 15 minutes. If soupy, continue cooking until reduced. Tuck clams and tomatoes into rice and cover and cook 3 minutes. Then tuck mussels, scallops, and shrimp into mixture and cook until clams and mussels are open and scallops and shrimp are just cooked through, adding peppers and peas in the last minute of cooking time. Serve with lemon wedges. What would the big difference be if I cooked this on a gas grill…would I lose a lot of the smokey flavor? Have you ever tried that? Thank so much…..love your recipes as usual! This looks SO good! I’m excited to try it, but for one pressing question…how do I season the pan so the rice gets that nice crunch, but doesn’t stick too much? Hi Lucy. I treat my paella pan as I do my cast iron pan; with loving care and tenderness! Never soup, never a dishwasher, never brillo; I just rinse, dry, lightly brush with olive oil, sprinkle with a bit of kosher salt and I use the pan as often as I can (it doesn’t have to be used exclusively for paella.) If there’s a lot of sticky stuff that refuse to come off, I let it soak in warm water a bit. If you treat your pan like this, you will get the crunchy crust and has little problems with too much sticking. I hope I answered your question! 1. Do not use cheap saffron. We found some less expensive saffron in the International section at the grocery store. The saffron flavor was LITERALLY nonexistent in the Paella. 2. We tried skinless drumsticks – they were ok but in the future I will stick to skin-on legs or thighs – I think the extra fat in the skin helps flavor during cooking. 3. We did not have “Sweet Spanish” paprika so I used smoked paprika – I think it helped enhance the smokey flavor. 4. Use the best spiciest Chorizo you can find. First time we got it from a butcher shop and it was great. The second time from Whole Foods and it had no flavor. Very disappointing. 5. We could not find Bomba rice so we used Valencia and it was great. 6. We are not fans of clams & mussels so we just left them out. Hi Stephan. Thanks very much for your comments. I’ve been on a grilled paella kick lately and agree with everything you’ve said, esp. about the chorizo. Like you, I’ve found it’s hard to get good chorizo unless you go to a butcher who knows his stuff; otherwise it’s rather bland and good chorizo lends a great deal to the finished product. I got my Bomba from Zingerman’s and it’s good to know the Valencia worked, esp. with the liquid to rice ratio.